The last truck that you might recall from the house of Fiat could be the Chrysler Auto’s Ram; otherwise they have been missing from the segment. However at the recent Auto show they unveiled the powerful and gorgeous Fiat Fullback Concept 2016. The truck is commendably design to compete with the already present Colorado, Hilux and Navara NP300. 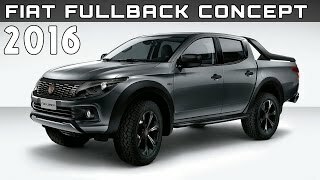 Let us have a look at the review of Fiat Fullback Concept 2016 to know if it has to potential to gain the desired accolades. The interior of Fiat Fullback Concept 2016 is a carry forward to the cabin we saw in Triton models. The black drenched cabin looks extremely gorgeous and neat. Especially the comparatively slim steering wheel featuring the Fiat logo in center is worth an appreciation. The well arranged dashboard looks clean, however it portrays the raw materials used to create are hard plastic and some other low budget materials. Behind the steering wheel we have a massive set of two gauges with a TFT display in center, together making the instrument cluster. With the high end trims buyers will get extra features like, heated front seats, a 12-volt power port for charging and a USB drive. Additional features include cruise controls, keyless entry, redundant radio controls and automatic climate control system. Thus rounding up the interior details of Fiat Fullback Concept 2016 I would call it as a perfect amalgamation of tech and looks. Just like the interior, exterior of Fiat Fullback Concept 2016 looks similar to the Mitshubishi truck. Starting with the front fascia it has the grille with Fiat logo while the lower section has updated looks and a set of fog lamps covered in black. Company has also concentrated on lowering the manufacturing cost of model while creating the fenders, doors and cargo bed. It has marvelous finishing accompanied by alloy wheels, chrome accents and bed-mounted roll bar. Apart from these, everything is just the same as the model mentioned above. 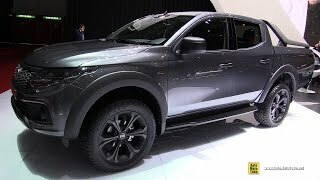 Thus rounding up the exterior details of Fiat Fullback Concept 2016 I would call it a gorgeous truck. 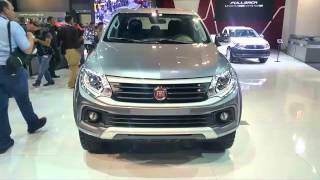 For Europe and other markets (excluding middle east and Africa), beneath the hood of Fiat Fullback Concept 2016 will come a 2.4 liter turbodiesel engine producing total output of 150 and 180 hp. The engine will come paired to either a six-speed manual transmission or a five-speed automatic transmission. 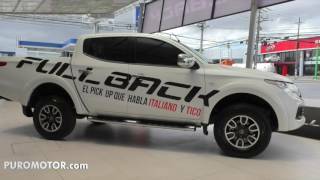 The performance figures of Fiat Fullback Concept 2016 are still not shared, but we do know that it can tow up to 2300 pounds.